Keris Bugis Sulawesi Luk 3 Junjung Darjat 0419 - A very good and rare example of a keris from the southern Sulawesi region of Bugis. Handle in the kerdas form, is made from albino buffalo horn. Top sheath in the tebeng form is made from kemuning woods, with the bottom stem having repoussed silver panels at the top and bottom, with the front showing an endless swirl, and a five pointed star at the back. Thick, heavy and very sturdy blade with 3 waves and well executed base features or perabots, having an overall shape or dapor called Jangkung in Javanese. Pamor patterns are arranged in the miring technique, showing peaks forming from the base till the tip. This arrangement is called junjung darjat or status upheaval, said to be meant for high ranking personals. Price:- US$1,150 excluding shipping. NEW. Keris Bugis Sulawesi Luk 11 Perak Penuh 1017 - A very good and rare example of a keris from the southern Sulawesi region of Bugis. Handle in the typical Bugis kerdas or pistol grip form, and sheath is made of wood and is fully encased with repoussed silver. Long and sturdy blade with 11 waves or luks with typical Bugis features or perabots, having also the angled edge and a hexagonal cross section. Pamor arrangements are forged in the mlumah technique with the base with a peak like formation called pamor ujung gunung or mountain peak. Above it are circular arrangements of the pamor bendo sagado. The pamor ujung gunung is said to enhance the owner's status while the pamor bendo sagado is for popularity. Keris Pedang Bali Pelet Perak 1217 – Another very rare example of a keris from the island of Bali or Lombok called the keris pedang, or sword keris. Handle and sheath or wrangka in the typical Balinese gayaman form, are made from well selected pelet woods, with natural contrasting grains that appear due to fungus attack on that particular part of the tree only. Back of the sheath has a gold plated silver embedment over the wood with semi precious, red and blue sapphire stone insets. Bottom stem or gandar, is encased with finely repoussed silver exposing the woods at the front, but fully encased at the back. A combination of silver (selut) and brass ferrule or mendak with semi precious, red and blue sapphire insets, completes the fittings. Keris Panjang Lurus Penyalang Melayu Ulu Garham 0419 - Another very good and rare example of a long keris form the northern Malysian peninsular regions of Kelantan or Patani. Handle in the horse hoof or tapak kuda form is made from the rare fossilized mammoth molar, with the top sheath in the sabit bulan or crescent moon form made from very well selected kemuning woods. The bottom stem is made of angsana woods having with a well repoussed silver alloy ferrule or pendoko to complete the fittings. Pamor patterns are not contrasting, which is the norm from the area, due to the non nickel metals used. From the forging lines the arrangements are of the mlumah technique and are of the wos utah or scattered rice variations. Price:- US$1,050 excluding shipping. NEW. Keris Pedang Lombok Lurus 0718 - Another rare example of a keris from the island of Lombk, called the keris pedang or sword keris. Handle and the sheath or wrangka in sandang walikat Lombok form, and is made of well selected hard blackwoods woods. A silver ferrule or mendak studded with semi precious stones completes fittings. Long and very sturdy blade has the base and ganjar or cross piece made without a gandik (blunt part), and with the sharp edge on both sides of the blade only at the top half where it bends downwards. These features are typical of the shape or dapor called keris pedang or sword keris. Keris Cirebon Luk 5 Kelingan 0119 - Another very rare example from the northern Javanese coastal region of Cirebon. Handle in the bebondolan form is made from rare contrasting grained wood located along the middle called pelet kendit. Sheath in the sandang walikat form is also made from rare contrasting grained wood called pelet awar-awar. A thick silver ferrule or mendak with low grade rubies insets completes fittings. Very long blade with prominent spine and 5 meandering waves or luks having deep picetan and rather plain fretworks, has an overall shape or dapor called Hanoman. Pamor patterns are not using contrasting metals, and are less commonly found in Java. It is called besi kelingan or black metals. Price:- US$890 excluding shipping. NEW. Keris Bugis Sulawesi Lurus Sundang 0217 - A very rare example of a keris from the southern Sulawesi region of Bugis. Handle in the typical Bugis pistol grip or kerdas form, and top sheath in the typical Bugis tebeng forms, are made of very well selected kemuning woods with flashing grains. The bottom stem is made of angsena woods with a thick brass bottom tip, and a thick brass pendoko or ferrule to complete. Very rare blade form, with a straight or lurus profile but having an angular or sepokal form blade. The perabots or base features has very strong sundang influences as well as the chiseled motif above the base. Keris Jawa Timur Luk 9 Ladrang Kayu Pelet 0617 – A very good example of a keris from the eastern Javanese regions. Handle is made of hard woods and is finely carved with pierced through works, with the top sheath or wrangka in the ladrangan branggah styles, made from very well selected pelet woods with contrasting grains. Bottom stem or gandar is encased with a thick well repoussed silver stem cover or pendok bunton. Long and very sturdy blade with 9 waves or luks and very well executed perabots or base features having an overall shape or dapor called carita. Pamor patterns are arranged in the mlumah technique or the kulit semangko or melon's skin variations, which is said to enhance the owner's popularity. Keris Cirebon Lurus Ulu Tandok 0916 - A very good example of a keris from the northern Javanese coastal region of Cirebon. Finely carved handle is made from white deer horn or kijang putih, and is in the form of a hidden deity called the putra satu. Top sheath or wrangka is in the gayaman from and made from pelet woods with naturally occurring contrasting grains. Bottom stem or gandar is encased with an open brass stem cover or pendok blewah. Thick, strong and very sturdy blade with a straight or lurus profile and plain base features or perabots, having an overall shape or dapor called tilam upih. Pamor patterns are arranged in the mlumah technique showing contouring patterns and compact smooth surface called pamor kulit semangko or melon skin pamor. Keris Bali Lurus Garapan Ulu Bahtera Banyu 1217 – A very good example of a keris from the island of Bali. Handle in the form of a deity called Bahtera Banyu, is made from wood encased copper, having colored glass insets. Sheath or wrangka, is in the Gayaman Bali form, and is made from well selected pelet woods, with natural contrasting grains that appear due to fungus attack on that particular part of the tree only. Very long and sturdy blade straight or lurus blade, has a thick spine and well define features or garapan, typical of the Balinese styles. Pamor patterns are arranged in the mlumah technique, of the kulit semangko or melon’s skin, having the concentration on the thick spine. Keris Bali Lurus Kebo Teki 1118 - Another very rare example of a very long keris from the island of Bali or Lombok. Handle and sheath or wrangka in the typical Balinese gayaman form, are made from pelet woods, with natural contrasting grains and is fully encased with well repoussed silver alloy outer cover. Long and sturdy blade, with well executed perabots or base features, has the elongated gandik called kebo teki using one kembang kacang or elephant trunk like feature. It has an overall shape or dapor called kebo teki. Pamor pattern are arranged in the mlumah technique, of the kulit semangko or melon’s skin. The pamor kulit semangko is said to enhance the owner’s popularity. Keris Bugis Sumbawa Luk 15 Kala Wija 0718 - A very good and rare example of a keris from the eastern Indonesian island of Sumbawa which has strong Bugis influences. Handle in the jawa demam form from bone, and top sheath is made from well selected kemuning woods with natural flashing grains. Bottom stem is fully encased with finely repoussed silver alloy stem cover or pendok. A filigree silver ferrule or pendoko completes fittings. Thick and very sturdy blade with rare 15 waves or luks and a prominent thick spine. It also has very well executed perabots or base features with an overall shape or dapor called kala wija (Javanese). Pamor patterns are very condense and are arranged in the mlumah technique of the uler lulut or snake skin variations, which is said to enhance the owner’s status. Keris Melayu Terengganu Luk 9 Anak Ayam Teleng 0419 - Another very good example of a keris from the northern Malaysian peninsular region of Terengganu. Handle in the Terengganu's version of the jawa demam form called the anak ayam teleng or cuddling chick, is made from very well selected ketengga woods with naturally occurring contrasting grains. The top sheath in the tebeng form is made from very well selected kemuning woods with natural flashing grains. Bottom stem is made from well selected angsana woods with a pierced through silver pendoko or ferrule to complete fittings. Very sturdy blade with 9 waves or luks, with base features or perabots having strong Bugis influence as well as the flat surface and angled edge called gusen, making it having a hexagonal cross section. Price:- US$790 excluding shipping. NEW. Keris Pedang Bali Lurus Ulu Kusia Tandok 0218 -Another rare example of a keris from the island of Bali, called the keris pedang or sword keris. Handle is made of buffalo horn, and depicts a figurine called Kusia; a locust like insect. The sheath or wrangka in the axe like Balinese form, and is made of well selected sono woods, with natural contrasting grains. A silver ferrule or mendak studded with semi precious stones completes fittings. Long and very sturdy blade has the base and ganjar or cross piece made without a gandik (blunt part), and with the sharp edge on both sides of the blade only at the top half where it bends downwards. These features are typical of the shape or dapor called keris pedang or sword keris. Pamor pattern are arranged in the mlumah technique, of the kulit semangko or melon’s skin. Keris Melayu Bugis Lurus Tikel Alis 0714 - Another very good example of a keris from the northern Malaysian peninsular region of Terengganu. Handle in the Terrenganu’s version of the jawa demam form called the anak ayam teleng or cuddling chick, is made from very well selected kemuning woods with the top sheath in the tebeng form, made from very well selected kemuning woods with natural flashing grains. Bottom stem is made from well selected angsana woods with a thick brass pendoko or ferrule to complete fittings. Exceptionally thick and sturdy with base features or perabots having a very prominent tikel alis (deep fuller near the base) and strong Bugis influence as well as a swollen cross section. Keris Bali Luk 9 Ulu Dewa Tandok Rusa 0218 - A very good example of a keris from the island of Bali with the handle in the form of a Hindu deity, made of white deer horn. Top sheath or wrangka, in the gayaman Bali form, is made from very well selected pelet woods with natural contrasting grains. A silver ferrule or mendak studded with semi precious stones completes fittings. Sturdy blade with 9 waves or luks has well executed base features or perabots that is deep and typical of the Balinese styles. The lime stone polished, smooth surface finish is also another typical Balinese characteristics. Keris Anak Alang Lurus Sumatra Riau 0119 - A rare example of a keris from the southern Sumatran regions of Riau Lingga. Handle made of buffalo horn is well carved in the form associated to the horse hoof o tapak kuda. Top sheath made from well selected kemuning woods is not in the usual sabit bulan or crescent moon form, with petals protruding from the sides. Bottom stem is made from hard black woods (ebony), having plain silver bands at laces. A thick silver ferrule or pendoko completes fittings. Rather long and very sturdy straight blade, has the base features or perabots very well executed, having altogether 6 ron dhas present at the grenengs. The overall shape or dapor is called anak alang, and it shares many similar characteristics to the longer keris panjang or executioner's keris. Price:- US$650 excluding shipping. NEW. Keris Panjang Riau Tapak Kuda Tandok 0918 - Another very good and rare example of a long keris form the southern Sumatran region of Riau Lingga. Finely and deeply carved handle in the horse hoof or tapak kuda form is made from buffalo horn with the top sheath in the sabit bulan or crescent moon form made from well selected kemuning woods. The bottom stem is made of angsana woods with silver bands, and a horn bottom tip, in the patat lipas or roaches’ back form. A well filigree silver alloy ferrule or pendoko completes fittings. Long, slim and very sturdy blade with very well executed base features or perabots typical of the keris panjang forms. Keris Bugis Riau Lingga Luk 5 Unthuk Banyu 0119 - A very good and rare example of a keris from the southern Sumatran regions of Bugis Riau Lingga. 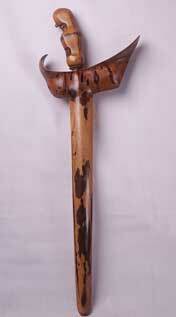 Handle in the typical Bugis pistol grip or kerdas form, is very finely and deeply carved from hardwoods. Top sheath or sampir is made from well selected kemuning woods with flashing grains. Bottom stem is made from angsena woods with a kemuning bottom tp or buntut. A pierced through silver pendoko or ferrule completes fittings. Very sturdy blade with five meandering eaves or luks and prominent spine. Base features or perabot are well executed and has an overall shape or dapor called Hanuman in Javanese. Price:- US$590 excluding shipping. NEW. Keris Panjang Sepokal Riau Lingga 0319 - Another very good and rare example of a long keris form the southern Sumatran region of Riau Lingga. Finely and deeply carved handle in the horse hoof or tapak kuda form is made from buffalo horn with the top sheath in the sabit bulan or crescent moon form made from well selected kemuning woods. The bottom stem is made of angsana woods with a horn bottom tip. A well repoussed brass alloy ferrule or pendoko completes fittings. Long, slim and very sturdy blade with very well executed base features or perabots typical of the keris panjang forms, and it also has an angled profile that is called sepokal in Malay. Price:- US$550 excluding shipping. NEW. Keris Melayu Bugis Luk 9 Semangka 0918 - A very good example of a keris from the southern Malay peninsular regions of Johore or Selangor. Handle in the kerdas form and top sheath in the tebeng forms, are made from very well selected kemuning woods with contrasting and flashing grains. A pierced through silver ferrule or pendoko completes fittings. Thick and very sturdy blade with 9 waves or luks, has well executed base features or perabots, with an overall shape or dapor called carita. Pamor patterns are very condense, and shows forging in the mlumah technique, of the kulit semangka or melon's skin patterns. Keris Bali Lurus Tulang Pulo Tirto 0218 - Another very good example of a keris from the island of Bali with the wooden handle in the form of a Hindu deity, and the top sheath or wrangka, in the gayaman Bali form, made from well selected pelet woods with natural contrasting grains. A brass ferrule or mendak studded with semi precious stones completes fittings. Very sturdy straight blade with prominent spine or tulang, has well executed base features or perabots that is deep and typical of the Balinese styles. Pamor pattern are condense and are arranged in the mlumah technique, of the pulo tirto or thousand island variations. It is said to enhance the owner's material well being. Keris Bali Luk 9 Ulu Kusia Dwi Warna 1017 - A good and rare example of a keris from the island of Bali. Handle is made of buffalo horn and is well carved in the form of a beetle called the kusia. Top sheath is made of dark ebony wood called aring, and bottom stem is made from well selected pelet woods having naturally occurring contrasting grains. 9 waved blade or luks with typical Balinese smooth finish, having rare pamor arrangements with the base with a peak like formation called pamor ujung gunung or mountain peak. Above it are arrangements of the pamor kulit semangko or melon skin pamor. The pamor ujung gunung is said to enhance the owner's status while the pamor kulit semangko is for popularity. Keris Cirebon Luk 7 Adeg 1217 – Very good and rare example of a keris from the less exposed northern Javanese regions of Cirebon. Handle in the cylindrical form is finely carved of ebony wood, having flowing motifs and a hidden face. Sheath or sampir in the boat like form, unique to the Cirebon styles, is made of well selected kemuning woods, with the bottom stem of gandar, encased with finely repoussed silver stem cover. Sturdy blade with 7 meandering luks or waves, and base features or perabots that may be classified as the dapor sempana in central Javanese. Pamor patterns are of the miring technique and shows vertical lines of the adeg or sanding variations. The pamor is said to protect he owner in times of chaos. Keris Bugis Sulawesi Lurus Sepokal Sampir Gembol 0618 - A very good example of a keris from the southern Sulawesi region of Bugis. 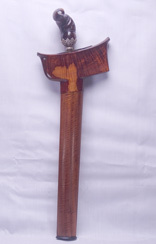 Handle in the typical Bugis pistol grip or ulu pangulu form, is made from hardwood kemuning , having a thick silver pendoko or ferrule to complete. Top sheath or sampir in Malay, is in the typical Bugis rectangular tebeng forms, is made from very well selected burl woods or gembol in Javanese. Thick and very sturdy blade, with a straight or lurus profile but having an angular or sepokal form blade. The perabots or base features has very strong Bugis characteristics, having a flat surface with angular edges. Keris Jawa Jogja Luk 9 Gangeng Kanyut 0617 – A very good example of a keris from central Javanese region of Jogjakarta. Sheath or wrangka is in the ladrangan Jogja form, with the top sheath made from very well selected pelet woods with naturally occurring contrasting grains. The hilt or ukiran is made from hard, well grained timoho woods with pierced through carving at the patras. Bottom stem or gandar is encased with finely repoussed silver with birds, animals and floral motifs typical of the region's styles. Very sturdy blade with 9 waves or luks and well executed perabots or base features, having an overall shape or dapor called sempena. Pamor patterns are rare and are arranged in the miring technique showing complicated contouring patterns called gangeng kanyut, which is said to enhance the owner's status. Keris Jawa Luk 7 Mayang Mekar 1017 - Very good example of a keris from the central Javanese regions of Solo. Wrangka or sheath is in the gayaman forms with the top sheath made from very well selected pelet woods, having contrasting grains. Bottom stem is encased with a silver alloy stem cover or pendok blewahan. Sturdy blade with 7 waved or luks having a prominent spine or ada-ada, with an overall shape or dapor called sempena. Pamor patterns are arranged in the less common miring technique, showing formations called the mayang mekar or "may blossoms". The pamor is said to enhance the owner's status and popularity. Keris Bali Lurus Garapan Gayaman Pelet Hanuman 1217 - A very good example of a keris from the island of Bali. Handle in the form of a monkey deity called Hanuman, is finely carved from hard woods, with a silver mendak or ferrule, studded with low grade rubies. Sheath or wrangka, is in the Gayaman Bali form, and is made from well selected pelet woods, with natural contrasting grains that appear due to fungus attack on that particular part of the tree only. Very long and sturdy straight or lurus blade, has a thick spine and well define features or garapan, typical of the Balinese styles. Pamor patterns are arranged in the mlumah technique, of the kulit semangko or melon’s skin, having the concentration on the thick spine. The pamor kulit semangko is said to enhance the owner’s popularity. Keris Bali Ulu Grantiman Rambut 1217 - Another very good example of a keris from the island of Bali. Top sheath in the gayaman Bali form is made from ketangga woods, with the bottom stem made from sono keling woods. The handle in the grantiman form, is made of wood and entwined with twisted human hairs. Very sturdy, straight or lurus blade, has well defined base features or perabots, typical of the Balinese styles. Pamor patterns are arranged in the mlumah technique showing only circumferential pamor lines called pamor wengkon, which is said to protect the owner from natural mishaps. Keris Jawa Jogja Luk 7 Sempena 0219 - Another very good and rather rare example of a keris from the central Javanese regions of Jogjakarta. Fittings in the gayaman Jogjakarta styles with the finely carved pierced through handle made from hard redwoods called gemia (Bouea microphylla). Top sheath is made from very well selected pelet woods with natural contrasting grains. A brass ferrule or mendak and a finely repoussed silver alloy frontal stem cover with a plain copper back, completes fittings. Very sturdy blade with 7 meandering waves or luks and prominent spine or ada-ada, has very well executed perabots, base features, that includes the kembang kacang, with an overall shape or dapor called sempana in Javanese. Keris Madura Lurus Kerang Naga 0918 - A very good and rather rare example of a keris from the island of Madura. Top sheath or wrangka, in the shell kerang madura form, is made from hard black ebony woods or kenaung, and is finely carved with the Naga or dragon. A well repossed brass outer stem cover or pendok bunton, and a brass ferrule or mendak, completes fittings. Very sturdy blade is straight or lurus, with well executed base features or perabots, that has an overall shape or dapor called sinom in Javanese. Pamor patterns are very condense, and shows forging in the mlumah technique, of the wos utah or scattered rice patterns. Keris Bugis Riau Luk 5 Ganjar Serias 0517 - A very good and rare example of a keris from the southern Sumatran region of Riau Lingga. Handle in the typical Bugis pistol grip or kerdas form, has added carvings at the front. The top sheath in the square tebeng form is made from very well selected kemuning woods with flashing grains. A well repoussed brass pendoko or ferrule completes fittings. Sturdy blade with 5 waves or luks having the base cross piece or ganjar made one with the blade and is called ganjar seiras. Pamor patterns are condense and are arranged in the mlumah technique having a peak like formation at the base called nunggak semi, and above it are circular formations called bendo sagado. Keris Jawa Timur Ganggeng Kanyut 1017 - Another good and rare example of a keris from the eastern Javanese regions. Fine carved "bulging" handle form called the bebondolan(?) is made of very well selected pelet kendit woods with a single dark grain going across the bid section. Wrangka or sheath in the ladrangah branggah forms, is also made with well selected pelet woods, having dark grains (dead cells) occurring due to fungus attack. Long and very sturdy straight or lurus blade, with well executed base features or perabots and a prominent spine, has an overall shape or dapor called sempena bener. Pamor patterns are arranged in the miring technique, and are called Gangeng Kanyut, which is said to enhance the owner's status. Keris Minang Kabau Lurus Sogokan 0918 – Very good and rare example of a short keris from the Sumatran region of Minang Kabau. Handle in the kerdas or pistol grip form and top sheath in the typical Minang Kabau, buffalo horn influenced form, are made from very well selected kemuning woods with flashing grains. Bottom stem is made of angsana woods with a brass ferrule or pendoko completing the fittings. Rather short but very sturdy straight or lurus blade with well executed base features or perabots, having deep base fullers or sogokan, and thick prominent spine.At the top of the ganjar or cross pieces, two animal figurines are seen, with minute remains of gold inlays. Keris Palembang Luk 7 Petola 0617 – Another good and rather rare example of a keris from the southern Sumatran region of Palembang. Hard wood handle is finely carved in the typical Palembang bird like form, with the top sheath also made in the typical Palembang's boat like form, is made from hard, well grained kemuning woods. Bottom stem is made of angsana woods with plain silver bands. A thick well repoussed brass ferrule or mendak completes fittings. Long and very sturdy blade with very sublime 7 luks or waves, has an overall shape or dapor called petola in Malay. Pamor patterns are arranged in the mlumah technique or the kulit semangko or melon's skin variations, which is said to enhance the owner's popularity. Keris Jawa Jogja Luk 9 Kelingan 0918 - Another very good and rather rare example of a keris from the central Javanese regions of Jogjakarta. Fittings in the gayaman Jogjakarta styles are made from very well selected pelet woods with natural contrasting grains. A brass ferrule or mendak and a well repoussed silver plated brass stem cover or pendok completes fittings. Very sturdy blade with 5 meandering waves or luks and prominent spine or ada-ada, has very well executed perabots, base features, that includes the nguku bima, and the ganjar wilut, or wavy base cross piece. It has an overall shape or dapor called Anuman in Javanese. Keris Minang Kabau Luk 9 Kulit Semangka 1218 - A very good example of a keris from the Sumatran region of Minang Kabau. Handle in the jawa demam form is well carved using kemuning woods. Top sheath also made from well selected kemuning woods with the bottom stem made of angsana woods. A well repoussed silver alloy ferrule or pendoko completes fittings. Long and very sturdy blade with 9 meandering waves or luks and well executed perabots or base features, has an overall shape or dapor called sempena bener. Pamor patterns are arranged in the mlumah technique showing a peak like formation at the base called ujung gunung, which is said to enhance the owner's status. Keris Palembang Lurus Sepokal Seiras 1118 - Another very good and rare example of a keris from the southern Sumatran regions of Palembang. Handle in the typical relief human figurine like form and top sheath in the typical boat like form, are made from very well selected kemuning woods with flashing grains. Bottom stem is made from angsana woods, having well repoussed silver alloy panels. A well repoussed silver ferrule completes fittings. Rather short blade, but is very sturdy and still sharp. Having a straight or lurus posture, but with a stark angular profile, called sepokal in Malay. The base cross piece, or ganjar, is also made one with the blade and is called ganjar seiras. Pamor patterns are not contrasting which is the norm form this particular regional variation of sepokal. Keris Madura Luk 5 Kelingan Ladrangan 0918 - A very good and rather rare example of a keris from the island of Madura. Top sheath or wrangka, is in the ladrangan madura form, and is made from well grained kemuning woods. Handle is made of pelet woods having naturally occurring contrasting grains. A well repossed brass outer stem cover or pendok blewah, and a brass ferrule or mendak, completes fittings. Sturdy blade with 5 meandering waves or luks, with interesting base features or perabots, that uses only one instead f two sogokans;- short base fullers. Keris Melayu Raiu Luk 5 Malela Budak/Patrem 0618 - A very good and rare example of a keris from the southern Malaysian peninsular region of Riau Lingga. Handle in the typical Bugis pistol grip or kerdas form, and the top sheath in the square tebeng form is made from very well selected kemuning woods with flashing and contrasting grains. A well repoussed silver pendoko or ferrule completes fittings. Very short blade, most probably meant for a boy, is very sturdy with 5 waves or luks having a prominent spine and fullers flanking; features common on the form called malela. Keris Bugis Sulawesi Luk 9 Pendok 0217 - Another good example of a keris from the southern Sulawesi regions of Bugis. Well carved hilt in the typical Bugis pistol grip or kerdas form is made from hard kemuning woods, with the top sheath made from very well selected woods with flashings grains. Bottom stem is encased with thick and well repoussed brass pendok or stem cover. Very sturdy blade with 9 meandering waves or luks, has and overall shape or dapor called sempena in Javanese. Pamor patterns are arranged in the mlumah technique of the kulit semangka or melon's skin pamor, which is said to enhance the owner's popularity. Keris Cirebon Lurus Patrem Kelingan 0918 - Very rare example of a keris from the northern Javanese coastal region of Cirebon. Finely carved handle in the form depicting a hidden deity, and made from hard woods with top sheath in the form less commonly seen but typical of Cirebon ladrangan style. Bottom stem is encased with a repousse brass stem cover. Rather short blade, is straight or lurus, and very sturdy, having the less common wavy base cross piece or, ganjar wilut. With the short nature of the blade, this strongly suggest a feminine use, or patrem in Javanese. Keris Anak Alang Lurus Kelantan 0119 - A rare example of a keris from the northern Malaysian peninsular regions of Kelantan. Handle made of kemuning woods is well carved in the jawa demam pekaka form and top sheath in the sabit bulan or crescent moon forms is made from well selected ketengga woods with contrasting grains. Bottom stem is made from angsena woods with a silver ferrule or pendoko completes fittings. Rather long and sturdy straight blade, has a slight angled profile and this is called sepokal. The overall shape or dapor is called anak alang, and it shares many similar characteristics to the longer keris panjang or executioner's keris. Pamor patterns are not contrasting which is common from the region, arranged in the mlumah technique of the wos utah or scattered rice variations. Keris Madura Lurus Wrangka Kerang Burung 0218 - A very good example of a keris from the island of Madura. Rare fittings is finely carved from hardwood, with the top sheath in the typical Madura kerang or shell forms, but is finely carved into a three dimensional cockatoo bird. Sturdy blade is straight or lurus, and having plain base features, it has an overall shape or dapor called tilam upih. Pamor patterns are arranged in the mlumah technique, of the kulit semangko or melon’s skin variations, and is said to enhance the owner’s popularity. Keris Jawa Timur Lurus Rubiyong Pelet 0215 - A very good example of a keris from the eastern Javanese regions. Fitting in the gayaman branggah styles is made from very well selected pelet woods with contrasting grains that occur naturally due to fungus attack only on that part of the tree. The sheath is also made from a single piece of wood, or seiras. Very sturdy blade with prominent spine and although is straight or lurus, it has a very angular profile like the sepokal of the Bugis or Malay blades. Base features or perabots are also very well executed using the kembang kacang, with jenggots and lambei gajah, including the minute fretworks or grenengs. The overall shape or dapor is called sepaner rubiyong in Javanese. Keris Jawa Luk 5 Campor Baur 0217 - A very rare example of a keris from the central Javanese regions of Surakarta. Sheath or wrangka is of the ladrangan Solo styles and is made from a single piece of wood or seiras. Bottom stem is encased with a plain brass stem cover or pendok, exposing the single piece of wood in the middle. Rare blade with 5 waves or luks, three located at the base and two at the tip. The overall shape or dapor is called campor baur in Javanese. Pamor pattern are forged in the mlumah technique of the wos utah or scattered rice variations. It is said to enhance the owner's material well being. Keris Jawa Lurus Tilam Upih Adeg 0117 - A very good example of a keris from the central Javanese region of Surakarta. Fittings in the gayaman form is made from very well selected pelet woods with naturally occurring contrasting grains. Bottom stem or gandar is encased with a plain brass stem cover or pendok blewah. Long and very sturdy straight blade with plain base features of perabots. With a slight “belly” at the mid section, it has an overall shape or dapor called jalak tilam upih. Pamor patterns are condense and are arranged in the miring technique showing vertical line arrangements called pamor adeg, or standing pamor. Keris Jawa Lurus Rojo Gundolo 0117 - A good and rare example of a keris from the central Javanese regions of Jogjakarta. Fittings in the gayaman form is made from very well selected pelet woods with naturally occurring contrasting grains having the bottom stem fully encased with a finely repoussed silver stem cover, or pendok bunton. Sturdy and straight blade with plain base features or perabot, has an overall shape or dapor called tilam upih. Pamor patterns are condense and are arranged in the mlumah technique of the kulit semangko or melon skin pamor. All patterns are unplanned or pamor tiban, and at the base there is a pamor tiban in a human figurine like shape called rojo gundolo. Price:- US$290 excluding shipping. NEW. Keris Jawa Timur Lurus Tilam Sari 0319 - Another good and rare example of a keris from the eastern Javanese regions, with the fittings or wrangka in the gayaman branggah forms, made from very well selected pelet woods having naturally occurring dark grains occurring due to fungus attack, and also flashing grains due to windy conditions. Long and very sturdy straight or lurus blade, with well executed plain base features or perabots, having only a small protrusion at the aring, has an overall shape or dapor called tilam sari. Pamor patterns are arranged in the mlulah technique, and are of the wos utah or scattered rice variations. Price:- US$270 excluding shipping. NEW. Keris Palembang Lurus Tilam Upih 0718 - A good example of a Palembang, South Sumatran keris. The typical regional form of handle in a human figurine like form, and the top sheath are made of hard and well selected kemuning woods with natural flashing grains, with the bottom stem made of angsena woods having a pin brass stem cover or pendok blewah. A repoussed silver ferrule or pendongko completes fittings. Straight blade with rather plain base features or perabots, has an overall shape or dapor called tilam upih. Pamor patterns are condense and are well arranged in the mlumah technique of the wos utah or scattered rice. It is said to enhance the owner’s material well being. Keris Jawa Luk 11 Sempena 0718 - A good example of an od keris from the central Javanese regions of Demak. Fittings or wrangka in the ladrangan Surakarta forms is made from well selected tayuman woods with the whole sheath made from a single piece of woods or seiras. A plain brass outer stem cover or pendok blewah and the silver ferrule competes fittings. Rather old blade with 11 waves or luks and well executed, but worn down base features or perabots, with an overall shape or dapor called sempena. Pamor patterns shows forging in the mlumah technique, of the wos utah or scattered rice patterns. It is said to enhance the owner's material well being. Keris Jawa Luk 7 Patrem 0718 - A good and rare example of a short keris from the central Javanese regions. Fittings in the gayaman Jogja forms with the handle made from very well selected trembalo woods and top sheath or wrangka made from naturally occurring contrasting grains called pelet. A brass ferrule or mendak with colored stone insertions completes fittings. Rather old blade, and is short but sturdy with 7 waves or luks. The short nature of the blade strongly suggests feminine use or patrem in Javanese. Pamor patterns are condense and are arranged in the mlumah technique of the pulo tirto or thousand islands variations, which is said to enhance the owner’s material well being. Keris Jawa Lurus Mesem Batu Lapak 0117 - A very good and rare example of a keris from the eastern Javanese regions. Handle in the typical Javanese planner or patra forms is made from hard trembalo(?) woods. The top sheath or wrangka in the ladrangan branggah form is made from well selected trembalo woods with natural flashing grains. Bottom stem or gandar is encased with a plain brass stem cover or pendok blewah. Thick and rather broad straight or lurus blade, has the base features or perabots very well executed, with an overall shape or dapor called mesem. Pamor patterns are condense and are arranged in the miring technique having vertical lines called pamor adeg, and at the base a semi circular formation is called pamor batu lapak. Both pamor is said to be o the protective nature. Keris Jawa Luk 3 Dhamar Murub 0217 - Another rare example of a keris from central Javanese regions of Surakarta. Sheath or wrangka is of the ladrangan Solo styles and is made from a single piece of wood or seiras. Bottom stem is encased with a plain brass stem cover or pendok, exposing the single piece of wood in the middle. Rare blade with 3 waves or luks, located at the tip, has an overall shape or dapor called dhamar murub in Javanese. Pamor pattern are forged in the mlumah technique of the wos utah or scattered rice variations. It is said to enhance the owner's material well being. Payments by American Express credit card, Western Union and PayPal accepted. We advise interested buyers to please feel free without any obligations to ask for more information's or pictures of the items interested. We are also open to any comments on our item's descriptions.